Apple Banana Milkshake is one of our favorite milkshakes. 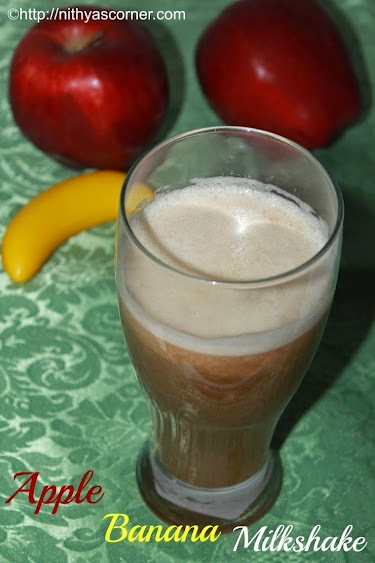 The two fruits, Apple and Banana, make a great combination. It is an excellent thirst quencher and also keeps you full for a long time. During summer, I usually try out lot of smoothies and milkshakes. However, I am not a big fan of juice but will try it once a while. 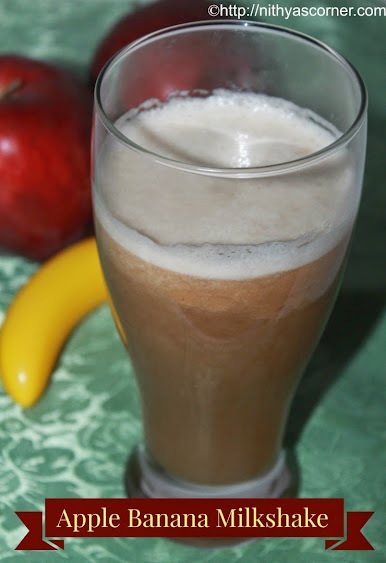 I like this milkshake because of its sweetness – Apple, Banana and Honey. I omit sugar because I feel apple and banana have sugar in them. Apart from that, I also add honey, therefore I omit sugar. It is absolutely your choice. If you desire, you could add sugar. Usually I blend apples with its skin as the skin has vitamin C and vitamin A. When I was young, my dad will not let me know if I don’t eat apples along with its skin. I like it or not, he will want me to eat the apples with skin. Now I got so used to it that if I don’t blend the apples with its skin, I feel that the milkshake is not complete and lacks something. Again, it is your choice of adding the apples with skin. If your blender does not grind the apple’s skin well, then you may leave it. Note. The ingredients shown will vary with the original quantity. Blend the apple pieces, banana, milk, and honey well. Pour it into your glasses. Serve chill. 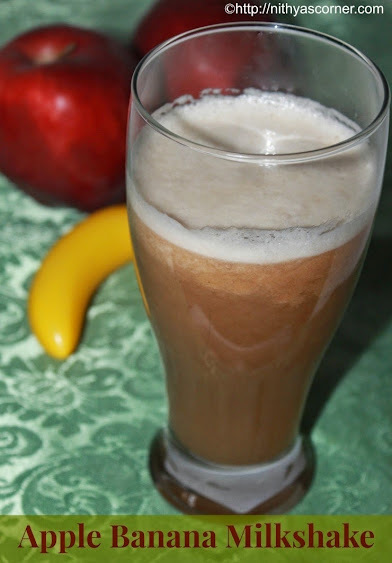 Now, Apple Banana Milkshake is ready! You can add 1/4 teaspoon of vanilla essence. Refrigerate for a few minutes before serving. You can also add a scoop of vanilla ice cream while blending. This entry was posted in Milkshake & Smoothie and tagged Apple, Banana Milkshake, Milkshake, Strawberry Milkshake on November 22, 2014 by vikashbhardwaz. Peel the avocado and cut it into two halves. Scoop the pulp of avocado and put it in the blender. Discard the seed. Grind the avocado pulp along with milk and sugar. Then, add the ice cubes and blend it again. I have not added ice cubes as the weather here was already very cold. 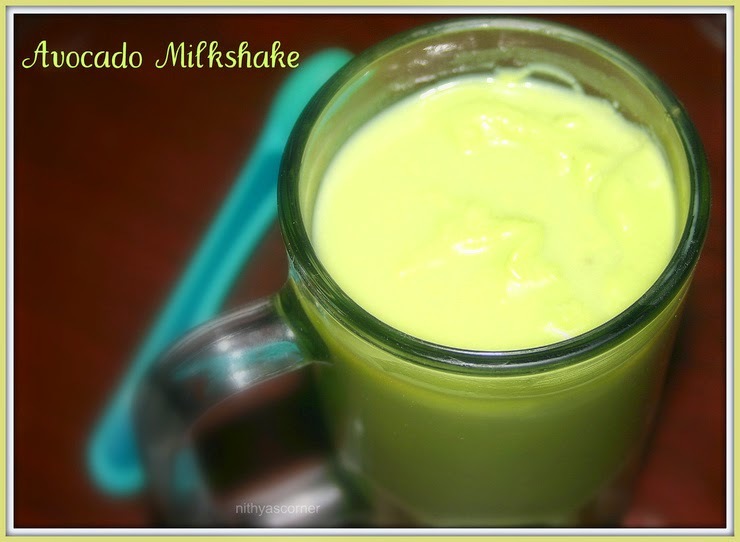 Now, the Avocado Milkshake is ready! 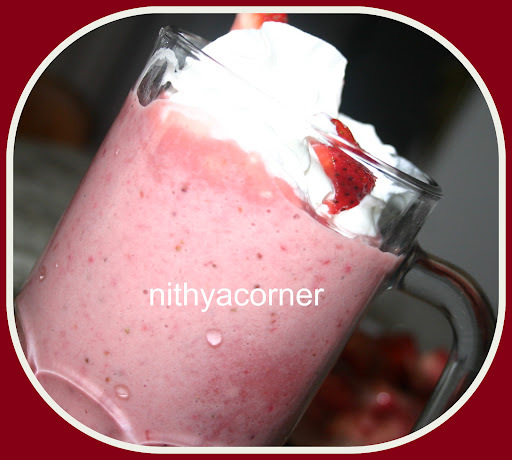 This entry was posted in Milkshake & Smoothie and tagged Avocado Milkshake, ice cubes, Milkshake, Recipe Category, Ripe Avocado, Strawberry Milkshake on November 22, 2014 by vikashbhardwaz. Most of the times, Gj comes home for lunch. I make Smoothie everyday for him. He would either drink it at home or will take it to his work place. During summer season, we buy avocadoes and pineapple in surplus. I make this smoothie at least thrice a week. Last week, I made this smoothie for my mom, and she instantly fell in love with it. She asked me if I had posted this smoothie recipe in my blog. I said it involves the combination of three fruits, so I haven’t. She immediately said that I should take pictures and post this recipe soon. My mom was behind me to post this recipe because she loved it so much. 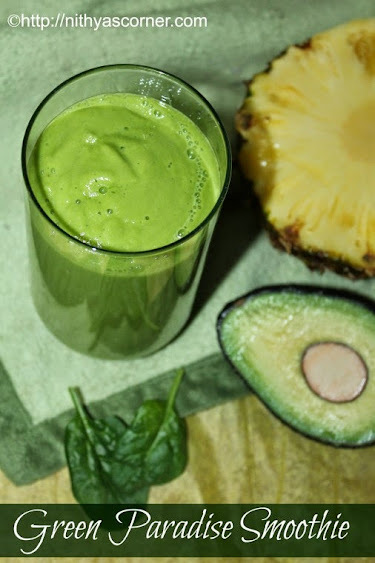 If you guys have pineapple, avocado and spinach at home, try this smoothie at least once. Needless to say, this smoothie is very healthy and tasty. 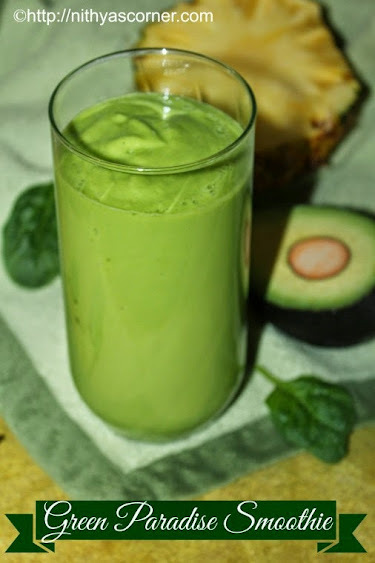 Try this smoothie once, I am sure you will start buying avocadoes and pineapple often. Also, when you grind the smoothie, you will not get the taste of pineapple, avocado or spinach. It is very difficult to find out what went into the smoothie. May be you could try this recipe and ask your family to find out. They will not be able to find out…I am sure. Challenge them! Add the ingredients to the blender in order listed and grind it smoothly. Pour it into the serving glass and serve chill. If in case you think the smoothie is thick, you can strain the smoothie and drink. Now Green Paradise Smoothie/Green Pineapple Paradise is ready! This entry was posted in Milkshake & Smoothie and tagged Pineapple Paradise, Smoothie, smoothie recipe on November 22, 2014 by vikashbhardwaz. An old-fashioned and classic milkshake! I tried this milkshake on one fine summer. It came out very like like any other milkshake. I make it often. Sometimes, I use cream and ice cubes. Definitely, a classic milkshake. Cut strawberry into pieces. In a blender, combine strawberry, milk, vanilla essence, sugar, ice cubes, and light cream. Blend well until milkshake becomes frothy. Now, Strawberry Milkshake is ready!!! 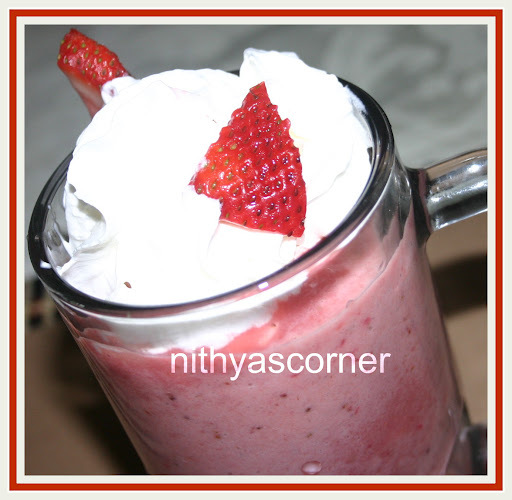 This entry was posted in Milkshake & Smoothie and tagged ice cubes, Strawberry, Strawberry Milkshake on November 22, 2014 by vikashbhardwaz.